Known for its luxury shops and quintessential Britishness, for many of us Mayfair is just a blurry memory from a night out on the town, or a window-shopping stop-off before hitting the more affordable Oxford Street. 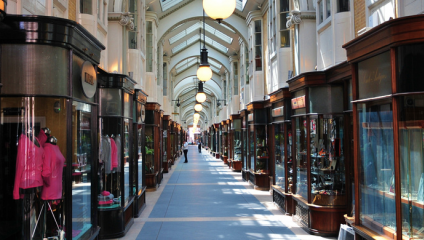 Whether you’re in the area ready to splash some cash or you’re lost on your way to Primark, why not have a wander around this beautiful corner of London and discover some of its wonderful hidden gems that won’t cost you a thing. This bronze statue of Roosevelt and Churchill sitting in relaxed conversation on a bench was created by Lawrence Holofcener and was unveiled in 1995 by the Bond Street Association to commemorate 50 years of peace. These two powerful men stood together against Nazism during WWII and later helped found the United Nations. Churchill and Roosevelt's bond secured a strong transatlantic partnership and forged the 'special relationship' between the UK and the USA that is frequently discussed today. In keeping with their principles, 'Allies' is a very approachable sculpture with the space in between the two figures open for people to come and hang out with these two inspirational leaders. The Allies Sculpture is located at 16 New Bond St, London W1S 3SU. Whether you need some much-needed respite after whipping the credit card out all day, or whether you need to escape the bougie bedlam that is Mayfair, make your way to this secret oasis of calm and peace hidden away in the middle of Central London. This elevated garden is on top of an old electricity substation and was originally provided for the residents of the neighbouring Peabody Estate apartments. The garden was restored in 2007 and there’s a lovely café up on the terrace where you can stop and recharge before hitting the shops again. Brown Hart Gardens is located off Duke Street, London W1K 6TD. Separated by a wall and 200 years, the homes of two of the world’s greatest musicians can be found in one of London’s busiest neighborhoods - but you might never know it. Head down bustling Brooke Street, and you’ll probably miss the two doors that mark the historical sight of both George Frideric Handel’s house and Jimi Hendrix’s former home. German-born baroque composer Handel moved to London in 1712 and was the first ever occupant of 25 Brook Street. The Handel Museum was opened in 2001 and, as of February this year, the adjacent house, 23 Brooke Street, was added to the already existing museum to commemorate Hendrix who was a resident of the building in 1968. This is the only home of Hendrix to be open to the public anywhere in the world, and when he moved into the £30-a-week flat in July 1968, Hendrix famously wrote: “This is my first real home of my own.” Visit the Handel and Hendrix home to see what home-life was like for these two musical geniuses. Handel and Hendrix home is located at 23 - 25 Brook St, London W1K 4HB. The museum is open Mon-Sat 11am – 6pm and Sun 12 - 6pm. Tickets are £10 and can be booked online. The world collectively wept when David Bowie passed away earlier this year. While Ziggy Stardust may have gone back to the star from which he fell, his spirit and memory will forever be remembered. Not only will we always have the music as a lasting legacy of the Starman, but there is also a commemorative plaque on Number 23, Hendon Street where David Bowie’s Ziggy Stardust emerged into the night on the cover of his album The Rise and Fall of Ziggy Stardust and the Spiders from Mars. The plaque was installed on March 28th 2012 and is one of just a handful of plaques extended to fictional characters in London. Ziggy Stardust’s plaque is located at 15 Heddon St, London W1B. If you happen to walk past Sotheby’s auction house in New Bond Street, take a moment to look up at the black basalt statue that sits above the entrance. The statue is a bust of lioness warrior goddess Sekhmet, thought to have been carved in Ancient Egypt around 1320 B.C. The Sotheby’s Sekhmet is the oldest privately owned outdoor statue in London. Apparently this Egyptian treasure came to Sotheby’s in the 1800s as part of a larger collection of Egyptian artifacts which was subsequently sold for £40. The statue’s buyer never came to collect it however, and thus Sotheby’s retained this priceless artifact for its own display. Sotheby’s is located at 34-35 New Bond St, London W1A 2AA. Ever wished you were queen for a day? While you might not get to sit on Queen Liz’s throne or even get the chance to join her for tea, you can get (almost) the next best thing by buying the same china that she uses. A visit to home-ware shop Thomas Goode will not only give you the opportunity to purchase china from the Queen’s official crockery-makers, but you can also visit Thomas Good’s archive showroom which has a whole host of priceless antique china on display. Highlights include a dinner service for Tsar Nicholas II, a service for Empress Catherine II of Russia, and a miniature-scale tea set commissioned by Queen Mary for her doll’s house. The archive also has examples of the dinner service produced for the HRH Prince Charles and Princess Diana’s wedding, and a selection of beautiful, bespoke commissions for, amongst many others, fashion designer Gianni Versace. Thomas Goode is located at 19 Audley St, London W1K 2BN. The shop and archive are open Monday to Saturday from 10am – 6pm.